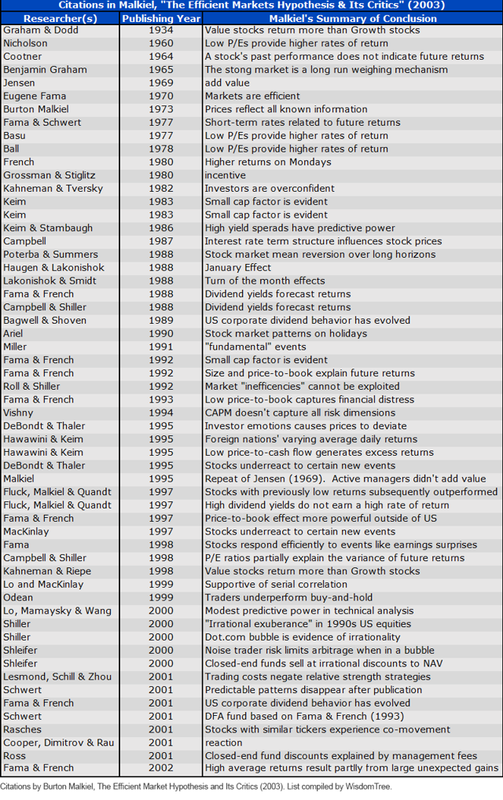 The S&P 500 Index has not been around as long as you think. The S&P 500 Index wasn't designed to be an investment. You know the methodology: each of the 500 stocks is weighted by its market capitalization. The supposed catalyst for choosing that methodology in 1957? The Efficient Markets Hypothesis (EMH) - the theory that all market-influencing information is already priced into stocks. But wait a minute… that may not have been the catalyst at all. There is a dog-eared copy of Princeton Professor Burton Malkiel's EMH groundbreaker, A Random Walk Down Wall Street, on every good academic's shelf. But after EMH was challenged, first in the wake of the 1987 market crash and then amid the dot.com rubble, Malkiel picked up his pen in 2003, citing no less than 57 works on the subject. Aside from Graham and Dodd - two academics who epitomize the opposite of efficient markets dogma - every single paper cited by Malkiel was written after 1957. The S&P 500 Index wasn't designed to be an investment. We know this because it came before the EMH. Don't forget that Jack Bogle's index fund was born in the mid-1970s, not a moment earlier. In retrospect, the rise of the methodology makes sense. The industry rightly benchmarked active managers against the commonly-cited S&P 500. The fund managers weren't so bad; their fees were. It wasn't that the S&P 500 was so superior; it was that it was being compared to mutual funds hindered by their own expenses. Here's a simple study: 1957-2018, weighting stocks by their earnings. Every December 31, rebalance. If S&P wanted an investable index, this earnings-weighting would have been a killer. 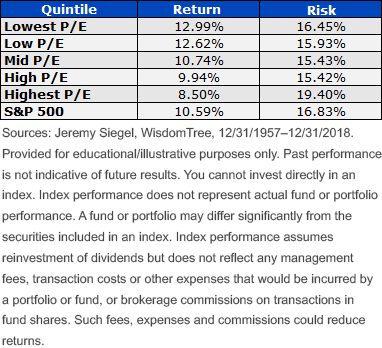 We recently cut the expense ratio on our earnings-weighted broad market "beta" fighter, the WisdomTree U.S. LargeCap Fund (NYSEARCA:EPS), to 8 basis points (bps) from 28 bps. Some chunk of the S&P's $9.9 trillion is tracking an accident of happenstance for fee reasons, not merit. Think of EPS as merit-based beta for those of us who believe fundamentals matter. There are risks associated with investing, including possible loss of principal. Funds focusing their investments on certain sectors increase their vulnerability to any single economic or regulatory development. This may result in greater share price volatility. Please read the Fund's prospectus for specific details regarding the Fund's risk profile.